Walking past Wilson Elementary School this morning, I noticed a banner reading "RUSSELL" in large letters placed over where you'd usually see "Woodrow" on the sign above the school's front door. 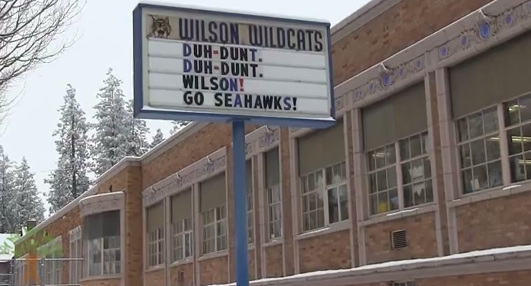 As kids many, many of them in Seahawks gear, with no shortage of Russell Wilson jerseys in the mix, filed through the doors, I figured somebody had to have caught on to it, and then found this video produced by Spokane Public Schools and released yesterday. Not only is the school celebrating the Seahawks amazing quarterback, they — prompted by what I'm going to go ahead and guess is the coolest principal on the planet, Tony Ressa — were doing the chant to a Phish song that Seahawk fans have been doing at Century Link Field all season. Appropriately, some national media outlets have picked up on this.